When you’re moving off to college for the first time, you need lots of things. It’s also an opportunity to start fresh with a blank canvas of a room. Except, you can’t do anything permanent and you probably have to share with at least one other person. That’s a pretty big wrench! The only photo I have of my freshman year dorm room. Just because there’s a wrench or too, doesn’t mean that you can’t determine your own style and bring it into the mix. Here’s a couple of strategies for determining your style and designing with roommates. Can you describe your interior design style? If you’re like me, words don’t immediately come to mind. I prefer to look at inspiration and pull out what speaks me and catches my eye. When you’re thinking about designing a new room, start with inspiration. Use Pinterest, snap pictures when you’re out shopping, whatever works for you. When you have a collection of images, look at them all together. You’re searching for things that are common across images. If something comes up 3 or 4 times, that’s a good place to start with design. One thing that always catches my eye in interior design is bright pops of color. A pink couch, a statement wall or even a colorful rug will pretty much always get my attention. When I went to college I knew I was going to want something colorful in the room to bring a bit of cheer! I ended up with a floral comforter that’s blue, pink and green. Good design is all about the colors. If you have a bunch of contrasting colors in the room, it will make it unpleasant to be in. You need to have a space you feel comfortable in and want to spend some time in, especially when you first move away. In an ideal world, roommates would coordinate and rooms would never clash. However, sometimes you don’t get a chance to talk to your roommate until you’ve both already bought things you love! If this is the case, don’t despair. Stick with neutral colors for everything else you buy – black, grey, and white go with everything and keep you from having too many things going on at once. Things on the wall is the easiest way to add personality to a room. Put up photos, canvases, art, posters, whatever floats your boat. They’re the best accessory for small spaces and they can be as personal as you want them to be. I cannot stress this one enough. You have to share a (small) space with your roommate for a year! It’s important to realize that you will probably have to compromise. If you’re all about designing your room, but your roommate could care less, that’s okay! Work with what you have and realize that it probably won’t be perfect. It’s better to be on good terms with your roommate when you move in, than be angry with matching bedding. 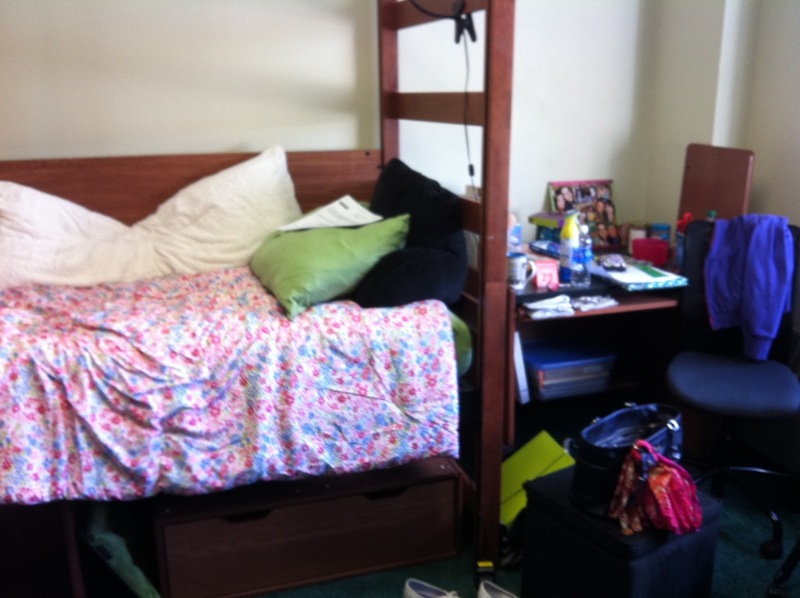 Whether you’re starting year one or four of college, it’s important to think about the space you’re living in. A warm inviting space can make a huge difference at the end of a long day of classes!